Because food is culture, and culture is its own important language. First up, pan de queso aka chipás! Or: cheese bread for the gluten-free (a group of which I am, sadly, a member). 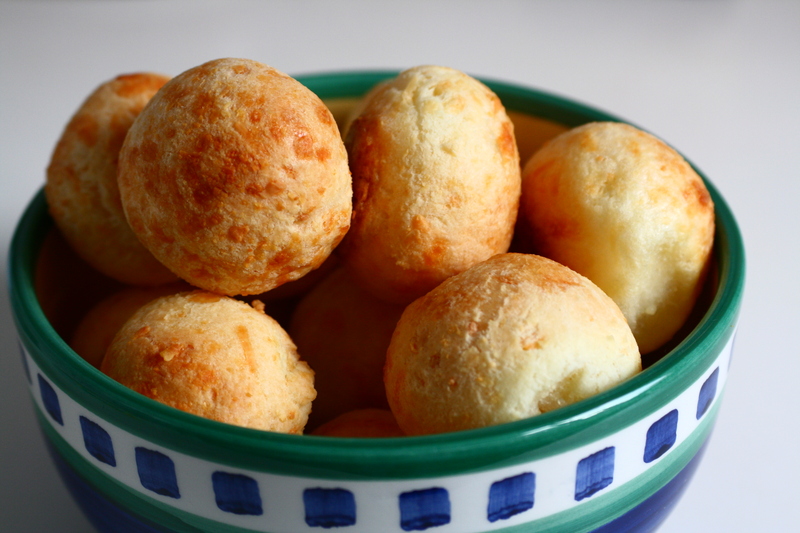 These little buns are more commonly known as pão de queijo and most people think of them as Brazilian but I first encountered them on the Argentinian side of the Argentina/Brazil border when I was visiting Iguazu Falls (the most jaw-droppingly awe-inspiring place I’ve ever been, by the way – you won’t be convinced from the pictures – you just have to see it to believe it). Sadly, I didn’t try chipás at the time even though they were touted as “traditional Misiones food: tapioca flour cheese bread” on the little English sign in the hotel’s breakfast buffet. I couldn’t be sure they were 100% gluten-free without asking someone to tell me exactly what was in them, and in order to do that and to understand the response I would have had to speak way more Spanish. Yet another reason why it is useful to learn other languages – to avoid accidental ingestion of substances toxic to your body. When I got home I did a bunch of googling and confirmed they were indeed gluten free and felt really sad. I had tragically foregone alfajores because of my condition but I hadn’t needed to miss out on cheese bread.